Watch full Naruto Shippuden Season 20 Episode 19 English Dubbed full HD online. Naruto Shippuden Episode 432 English Dubbed online for free in HD. Being caught in the Infinite Tsukuyomi, Tsunade dreams about changing the past that she sits near a lake and hears Jiraiya telling her that he finished his latest work before leaving. She looks at the papers, which are titled “Jiraiya’s Ninja Scrolls” and recalls when he was still in the middle of writing it and he asked her to be the first one to read it, even though she declined. As she reads it, the story begins with the tale of a nine tailed fox spirit, which can smash mountains and create tidal waves and a band of ninja arose to defend their village when it attacked until a lone shinobi staked his life to seal the beast away. The hero who fought the Nine Tails is revealed to be Minato, who survived the battle. One morning, he greets Kushina, who also survives and asks him how his meeting with the Third Hokage went. Minato remembers him and the Third meeting with the Uchiha clan to insure their allegiance with them will continue forever. Naruto wakes up and goes outside for the mission. The villagers are aware of Naruto being the JinchÅ«riki of the Nine Tails, but respects for him due to being the Hokage’s son. He arrives at the Uchiha compound to pick up Sasuke and greets Itachi. Sasuke is displeased to have to be picked up Naruto every morning and denies Naruto’s insistence they are friends before running off to meet up with their team. At the village’s gates, two guards find a passed out ninja, who only says “Ageha” when they ask him what’s wrong. Team 7 goes to the cemetery to visit the grave and monument of the ninjas who died in combat and tells them a story of a shinobi captain who committed suicide after being condemned for saving his comrades rather than completing the mission. He reminds them the importance of teamwork and asks them to go train. Sasuke privately asks why was he placed on the same team with Naruto, even though he says he is not against it. Kakashi assumes Sasuke, the best student of his class, is frustrated that the team is getting S-rank missions and blames Naruto, the last of their class, for this. 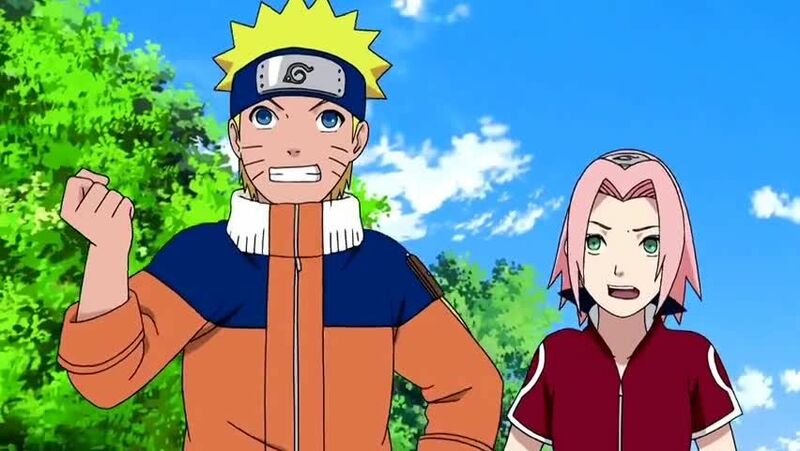 As Naruto and Sakura walk, he shows excitement for their mission and when asked by Sakura for this, he replies he is going to be Hokage one day. Sasuke agrees but adds due to Naruto being the Fourth Hokage’s son, he is shown favoritism. Angry, Naruto and Sasuke fight but Sakura stops them. Naruto challenges Sasuke to race with him to the top of a rock and takes off without warning. Sasuke and Sakura see a signal fired into the sky, and Kakashi tells them the Hokage is calling for them to assemble. As Naruto races to the rock, he vows to himself to never give up, and doesn’t notice the crack in the ground and falls. As he panics, he remembers Jiraiya telling him it would be interesting to see if the power that was given to him is truly for him and Naruto has to figure a way out if he lives. Naruto enters into his consciousness and encounters Kurama. Naruto is fully aware of Kurama being inside his body and demands Kurama lend him its chakra, to which Kurama replies he is mistaken and envelopes him with its chakra, saying that if Naruto dies so does Kurama. Naruto snaps back into reality and remembers when Jiraiya taught him the Summoning Jutsu, and Naruto successfully summons Gamabunta, saving himself. Kakashi, Sasuke and Sakura later arrive to find Naruto unharmed. In his office, Minato remembers the day the Nine Tails attacked the village and Kushina was about to reseal the beast back into her body, at the cost of her life. Minato convinced her to instead seal half of Kurama’s chakra in her and the other half in Naruto. In an earlier talk, Jiraiya told Minato that Naruto will learn how to control Kurama’s chakra in no time. Minato wonders that if Naruto is the “Child of the Prophecy” but has not fully controlled the Nine Tails’ chakra, was he too soon to give Naruto his mission. Team Kakashi, Guy, Asuma and Kurenai gather together and are informed they will be searching for missing shinobi, and they scatter to different routes.